King penguins are the second-largest penguins, with a striking patch of orange-gold feathers on their neck. They are expert divers, reaching depths of greater than 240 metres, but walk slowly and deliberately on land. Unlike their closest relative, the emperor penguin, kings prefer warmer temperatures and live in regions of the subantarctic. 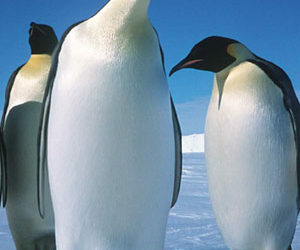 Although they look similar, king and emperor penguins rarely meet. King penguins live on the vegetated margins of subantarctic islands, meaning that they do not have to put up with the temperature extremes of the Antarctic continent. However, they too have highly unusual breeding cycles. King penguins lay a single egg any time from November to April and incubate it with their feet. Both parents share the parenting as open water is always close by. It can take 10 to 13 months to fledge a chick. Because of this long chick-rearing period, king penguins only produce two chicks every three years. When six weeks old, the chick joins a crèche while its parents go fishing. In a king penguin colony there may be 12-month-old chicks around while other birds are incubating eggs. In scientific books of the 19th century, the woolly coated chicks were listed as an entirely different species from their parents. Kings live in colonies of varying sizes, from 30 birds to tens of thousands. In the 19th and 20th centuries, populations were reduced through exploitation for their oil, flesh, eggs and skins. 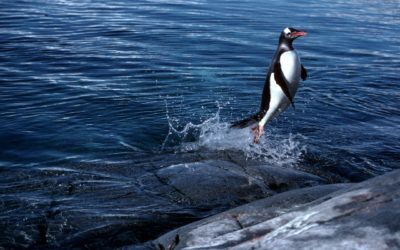 Populations are now thought to be expanding, and in 1993 there were estimated to be over one million breeding pairs.